The semiconductor industry is one of the most competitive global markets experiencing consistent month-to-month growth with annual global sales approaching $400B. There is a strong demand for integrated circuit technologies across growing markets, such as mobile devices and automotive electronics, with fierce international competition. This is driving an innovation race for enhanced process technologies, increased automation, and reduced product development timelines, in light of increasing development and fabrication costs. A new integrated circuit design can cost tens to hundreds of millions of dollars to develop. A new foundry can cost upwards of $15B to design and build. The need for innovation at a competitive cost presents a significant challenge to the semiconductor equipment and chip makers. This article will discuss how advancements in computational modeling and simulation can help meet some of these challenges. Plasma reactors offer precise control over processing steps including etching, deposition, cleaning, doping, and surface activation of materials in semiconductor integrated circuit manufacture. All of these rely on complex, highly nonlinear behavior of the plasma and its interaction with surfaces with limitless designs and configurations. They are powered by a variety of excitation sources (e.g. microwave, RF, hybrid DC/RF) and can be driven at one or more frequencies to form and control plasma discharges. The number and complexity of process steps required for a single chip are increasing; upwards of 500 steps in the most advanced memory fabrication. This further drives the need for faster and cheaper methods to evaluate and refine these processes. Simulation has gained traction to support these efforts, but is underutilized as the industry still relies heavily on iterative testing and engineering judgment. With the continual decline in computational costs, the semiconductor industry stands much to gain from a robust, high-fidelity, scalable industrial simulation solution. Refine processes for improved uniformity of ion densities and surface fluxes. Optimize process design with respect to etch uniformity and rate while controlling temperature to prevent wafer damage. Select operating conditions to control gas and surface reactions for various materials. Explore effects of varying feed gas mixtures and flow rates. Investigate chamber contaminants with simulated particle source methods. Provide better engineering insight into reactor performance through high fidelity simulation outputs that are not possible through experimental measurement techniques. This article will discuss three simulation approaches that offer unique solutions to these challenges for a variety of semiconductor applications. The OverViz Simulation Suite is an industrial, multiphysics framework with coupled plasma-fluid-electromagnetic-particle modeling capabilities with a comprehensive library of process chemistries. Three modeling approaches within OverViz are discussed: (1) reactor-scale modeling, (2) feature-scale modeling, and (3) fast-reactor-scale modeling. Each approach has unique benefits and applications. These approaches use a low-temperature, non-equilibrium formulation for multi-species, multi-temperature, self-consistent (and quasi-neutral) plasma systems. The relevant physics that is modeled is shown in Figure 1. A reactor simulation may involve the coupling of non-equilibrium plasma formation, gas chemistries, surface chemistries, compressible gas flow, magnetic field effects, microwaves, external circuit dynamics, ICP induced electromagnetic fields, and kinetic particles. These may be selected and configured to represent a large range of plasma reactor applications, such as a Capacitively Coupled Plasma (CCP) Reactive Ion Etcher, Inductively Coupled Plasma (ICP), and DC magnetron sputtering reactor. The three approaches for these applications is discussed next. The reactor-scale model is a high-fidelity representation of the reactor system, as shown in Figure 2. Physical features in this reactor model are on the order of centimeters and millimeters. Features on the order of 10’s of nanometers, such as etched trenches, are not represented in this model, but are represented in a separate feature-scale model. While it may be possible to represent both scales in a single model, it is far more computationally efficient to separate these into two scales. The reactor-scale is discussed first. VizGlow is used for performing reactor-scale simulations. The reactor is modeled using a finite volume representation that is solved using a well-established continuum/fluid approach. A time accurate formulation for the conservation equations is solved in 1D/2D/3D. Governing equations include species continuity, ion momentum, particle momentum, bulk energy, electron energy, electrostatic potential, electromagnetic wave, surface charge density, bulk flow, and external circuit. Both self-consistent (for resolving plasma sheaths) as well as quasi-neutral (high-density plasmas with negligible sheaths) may be represented. A drift diffusion approach is used for all species with an optional full momentum formulation for ions. Figure 2. Example simulation domain for reactor-scale model of a CCP. Electron number density shown. In addition to a continuum/fluid approach, the reactor-scale simulation may be solved using a hybrid approach that includes kinetic particles. Hybrid models combine a fluid model representation for bulk gas characteristics with a particle model representation of ion kinetics. With some additional computational expense, hybrid models provide better physical representation of ion behavior in the sheath region (particularly for lower pressures). These models provide the framework for performing reactor-scale simulations. A simple example of a parametric sensitivity to input power and presence of an external magnetic field is shown in Figure 3. The magnetic field provides higher densities with improved electron confinement. Figure 3. 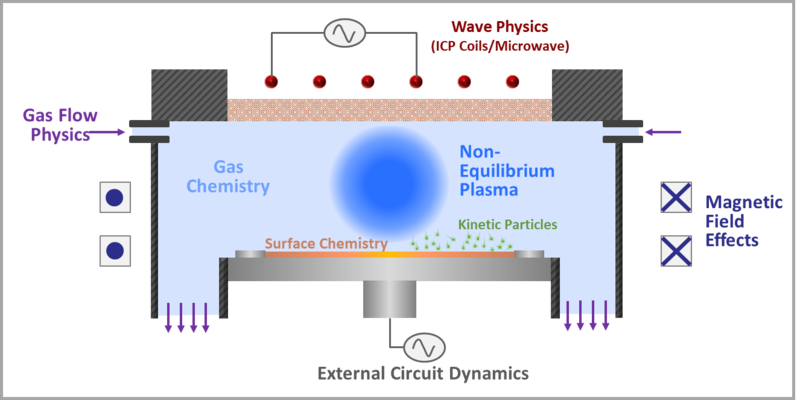 Example parametric simulations for plasma reactor operating conditions. Electron density shown. Another set of important outputs from the reactor-scale simulation are ion energy and angular distribution functions (IEADFs). The distribution and angle of ion impact determine how etched features form and evolve. Being able to quantify and control this behavior offers control over the etching process. For example, narrowing the angular distributions to have most ions impact the surface with normal incidence allows for high aspect ratio trench and via features to be etched. Simulated IEADFs at seven locations along a wafer surface are shown in Figure 4. The IEADFs at the first six locations are tightly distributed around 0° (normal incidence). Edge effects become very prominent at the seventh location where significant fraction of the ion impacts with large off-normal angles of incidence, thus compromising the process integrity at these locations. Figure 4. Ion energy and angular distribution functions along wafer radius. 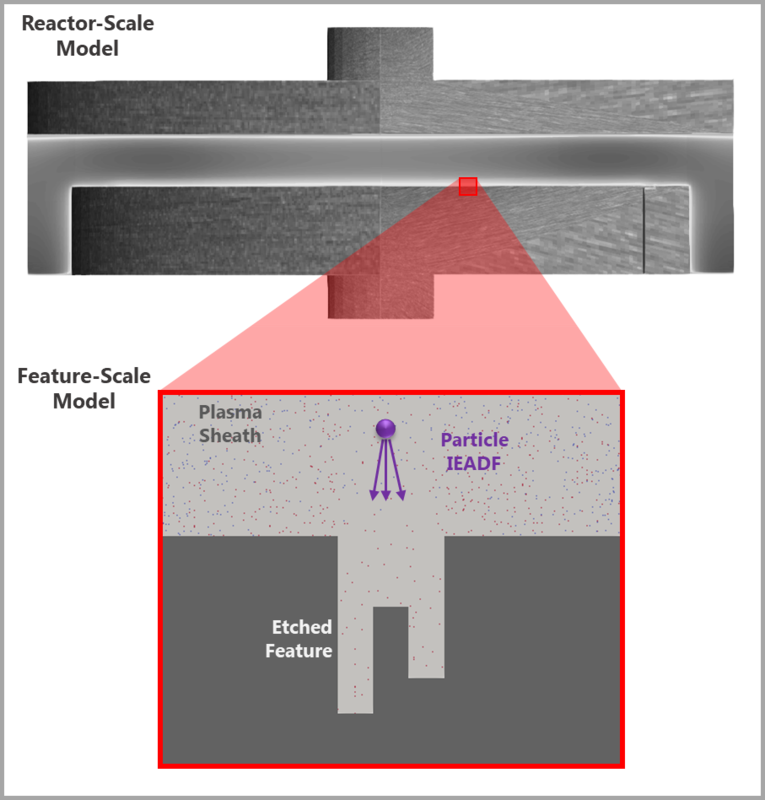 The feature-scale model is a sub-model of the reactor-scale model that locally resolves the physics around small features in the plasma sheath, such as etched trenches, which can be on the order of tens to hundreds of nanometers. Here mean free paths of the ions and electrons are large compared to the feature dimensions. Ion and electron motion must be represented using particle kinetics. IEADFs are therefore extracted from the reactor-scale model in the region surrounding the small features of interest and then used as boundary conditions for the feature-scale simulation. An example of this is shown in Figure 5. Feature-scale simulation runtime is similar to reactor-scale simulation runtime. Figure 5. Feature-scale model uses local solution from reactor scale model to resolve features on the order of nanometers. 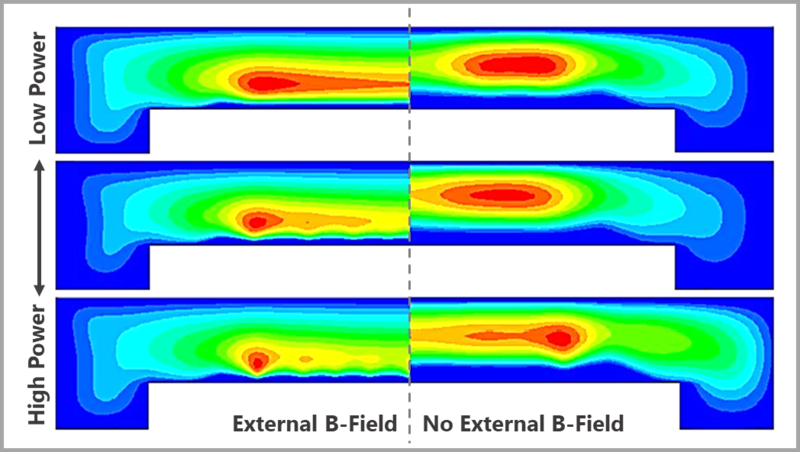 Example results from a feature-scale simulation for a dielectric surface exposed to a bias is shown in Figure 6. Ions approach the feature with very narrow off-normal angles and can therefore deposit directly at the bottom surface of the features, thereby imparting a net positive charge at the bottom surfaces. After passing through the sheath, electrons arrive at the trench with low energy and large off-normal incidence angles. Consequently, they deposit a negative charge at the corners of the feature. The differential charge deposition across the feature develops self-induced electric fields that can lead to dielectric breakdown damage. Figure 6. 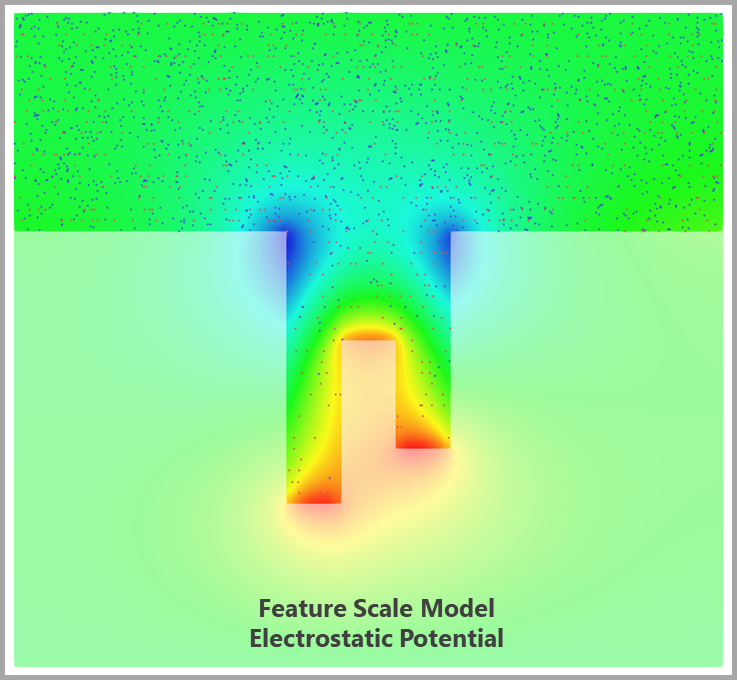 Example electrostatic potential solution from feature scale model of etched trench. Reactor-scale models resolve system performance on the length scale of the reactor, millimeters to centimeters. Feature-scale models resolve system performance on the length scale of the surface features, tens to hundreds of nanometers. Next, the fast-reactor-scale model is discussed. The fast-rector-scale model is a 0-D global representation of the reactor-scale model. ChemZone is used to perform fast-reactor simulation within the OverViz Simulation Suite. It solves the same governing equations for low-temperature, non-equilibrium, multi-species, multi-temperature plasma systems, including chemical reactions. However, the fast-reactor-scale model assumes that the reactor is well stirred, such that reactor gases are perfectly mixed and homogeneous. Reactor properties and constituents are assumed uniform through the reactor, allowing for a 0-D control volume representation. A schematic of a fast-reactor-scale model is given in Figure 7. The reactor is defined by volume V with homogeneous representation of bulk temperature, electron temperature, pressure, and species densities. It can also include mass inflow, mass outflow, energy source term, energy loss, and independent surface reactions. The fast-reactor-scale model provides detailed views of chemistry parameters, such as reaction rates and contributions of individual reactions to specific species. Very large chemistries can be represented, such as plasma discharge, neutral reactions, combustion, and chemical vapor depositions. Figure 7. Schematic for fast-reactor-scale simulation including inflow, outflow, and surface reactions. 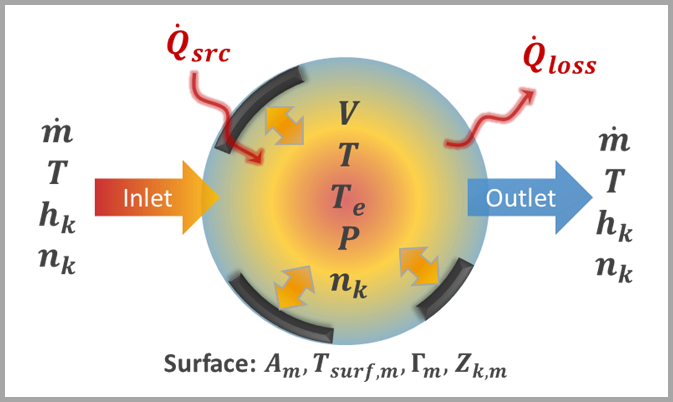 The primary benefit for the fast-reactor-scale modeling approach is its extremely fast runtime, requiring only seconds to minutes for full transient reactor simulations. This allows complex process design studies that involve hundreds or thousands of independent simulations that would not be possible with the standard reactor-scale model. This benefits semiconductor design and process engineers that may be responsible for executing extensive DOE experimental studies. What could take months to complete in the lab could be performed on a laptop in minutes. While experiments cannot be completely eliminated (and should not be eliminated, as experiments are critical to validating simulation results and verifying design performance), this provides an upfront analysis capability that could greatly reduce the time and costs required for fabrication process testing. Sample results for a fast-reactor-scale sensitivity analysis is shown in Figure 8. This study is used to identify which reactions dominate a reactor process. The time evolution of species densities is also shown. Figure 8. Example outputs for fast-reactor-scale sensitivity analysis. 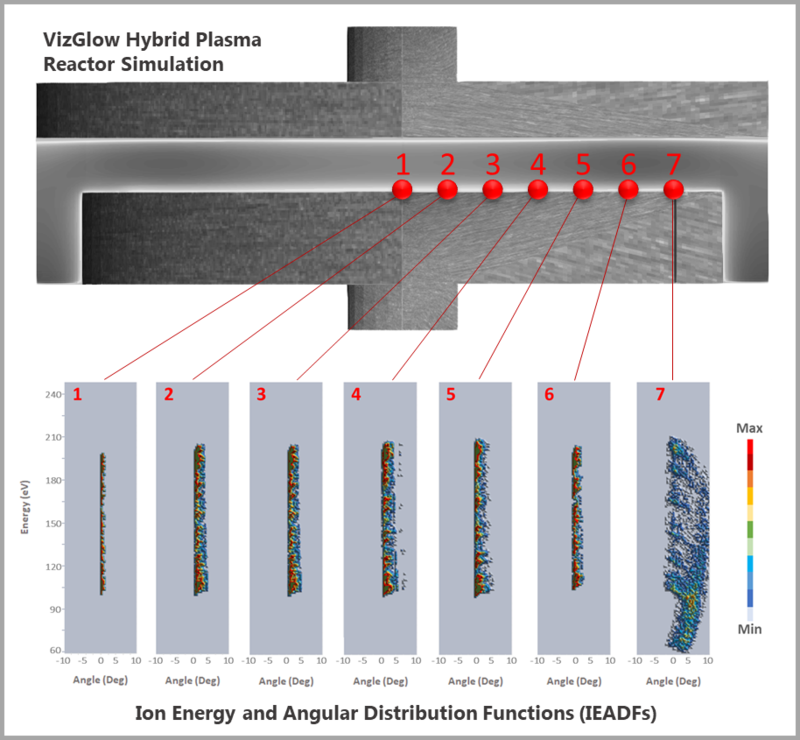 For well-stirred plasma reactors, the fast-reactor-scale model offers rapid process simulations for reactive flows and finite-rate chemical reaction mechanism development. Reactor-scale, feature-scale, and fast-reactor-scale modeling are three approaches that can be leveraged for different aspects of semiconductor processing. These simulation approaches can be used very effectively to supplement experiments to reduce time and cost associated with hardware iterations. They can also be used upfront in the design process to refine the design space before executing a single experiment. This accelerates the design and development lifecycle reducing cost. The simulations can also be used to troubleshoot issues in the fabrication process reducing downtime. Validated simulation can be an important tool in exploring innovation and shortening the development lifecycle. This is particularly useful in the semiconductor industry where the need for innovation and cost of development are growing as fast as the demand for their products. For more information about these modeling approaches or the OverViz Simulation Suite, please contact us at info@esgeetech.com.